It’s been a while since we have posted about the current scale of Gravatar. Since that post in 2008, things have changed quite a bit. We are now serving over 100,000 requests per second. That is over 8.6 billion requests per day – more than the number of people currently alive. With the help of our partners, Edgecast and Dyn, Gravatar is faster than ever. Distributing content across the world allows the majority of requests to complete in under 100 milliseconds – that is 4 times faster than the blink of an eye! No wonder more people are using Gravatar every day. In 2007, we replaced the (ugly) image URL /avatar.php?gravatar_id=HASH with the (pretty) URL /avatar/HASH. As firm believers in backwards compatibility, we continue to support both URL formats. In order to ensure the freshest content is served to all users, we now redirect the old URLs to the new ones. We suggest that if you are still using the old avatar.php?gravatar_id=HASH style URLs that you switch to the new style – it will be prettier and faster for your users. If you have any questions about this change, please refer to our documentation. Since Gravatar support has been added to WordPress, there are millions of WordPress sites using Gravatar every day. But did you know these other sites also use Gravatar? Want to learn how to integrate Gravatar with your website? Check out our implemetation documentation. Electronic Arts has implemented Gravatar in their upcoming Battlefield 3 video game’s online profile and game management site Battlelog. Battlelog is the new browser interface for the game, allowing you to find friends, servers to play on, groups to join as well as your stats. Wherever a user is listed on the site, be it on your friends list or on the list of people currently playing on a server, their Gravatar is shown. The raw data formats (JSON, XML, PHP) are based on the Portable Contacts standard to improve interoperability with existing tools and systems, while the other formats are existing standards for sharing certain pieces of data. We’ll be providing some example implementations to demonstrate just how powerful these options can be, and I’m sure that we’ll start seeing some creative implementations from folks in the near future. Here was the initial announcement around the coming profile data formats which I made at WordCamp San Francisco 2010 in May. You can also view the video on WordPress.tv. In our never ending quest to bring awesome profile power to gravatar users, we’ve added support for three awesome services: Gowalla, GoodReads and Google Profiles. And yes, it is true, given we are called Gravatar, we do have a secret preference for G named services. You can add these new services to your Gravatar Profile the same way you add any other service. Just click “Edit My Profile” under the “My Account” menu at the top of Gravatar.com and then go to the “Verified Services” section. Enjoy! You thought Gravatar Profiles were cool? Wait until you see them on all WordPress.com blogs. Today we’re upping your Gravatar Profile to a new level of awesomeness with Gravatar Hovercards. It’s now easy to find out about who is behind your favorite comments on WordPress.com simply by moving your mouse over their Gravatar. This new feature is enabled by default across WordPress.com. As a commenter, Hovercards offer a great way to show your Internet presence and help people find your own blog. If you’re a blogger on WordPress.com, you can quickly check out who’s commenting on your blog, and have an easier time connecting with them. If you haven’t set up your Gravatar Profile yet, just log in to Gravatar.com and fill out your details under Edit My Profile. If you don’t have an account yet, you can sign up here. 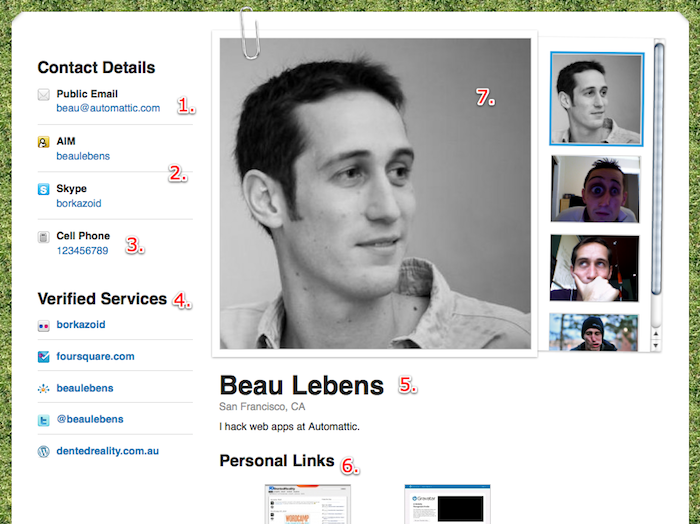 Check back soon for details on how to add hovercards to your own website, or any site currently using Gravatars. To set this up, first follow the download and installation directions found on the extension page above. 4. You’re all set. Enjoy! There’s more profile-data goodness coming soon, so check back here for the latest. Thanks to an email from the creator, we’ve been made aware of this really neat Gravatar-powered application for Mac users. Picture Finder is a free (but please donate!) application for Mac OSX 10.6 users that allows you to control the images that appear in Address Book on your system (which will also sync to your iPhone if you have one). It looks up all the different possible images for each contact based on any email addresses you have stored against them. It won’t keep images updated, but it does give you a quick and easy way to select an image for your contacts from one of the generated options, or their selected image if they have a Gravatar account. I enabled the option to “Replace pictures without double checking with me” and then I was able to just go through and double-click the image I wanted for each of my contacts. We absolutely love seeing Gravatar make its way off the web and onto your desktop, into your cell phone and everywhere else. Do you know of any other cool uses of Gravatars? Let us know in the comments!